1) Read a Book: Children learn well from stories and books because the message is non-confrontational and relatable. Stories give children a positive outlet for processing life. Books offer a chance to confront a difficult situation before it arises and for a child to gain perspective after a rough encounter. Before baby arrives and for months following, read your big kid stories about the experience of becoming and being a big brother or big sister. I recommend: On Mother’s Lap by Ann Herbert Scott, I’m a Big Brother/Sister by Joanna Cole, We Have a Baby by Cathryn Falwell (great for very young children) and The New Baby by Anne Civardi. 2) Balance: If you never “resorted” to TV or babysitters, adding a second, third (or maybe fourth!) sibling to the brood might be the precipice to your long withheld relinquishing of your parental ideals. Many parents find the transition from one baby to two babies lends the feeling that “something’s gotta give.” Accept that home life will change and that seeking balance will breed sanity instead of instability, which is essential for the development of your new baby as well as your older child. 3) Routine Machine: Children thrive through routine. Routine offers them a sense of predictability and control in what they perceive as a chaotic world. Adding a new baby is exciting, but it is also stressful and adds to life’s chaos. 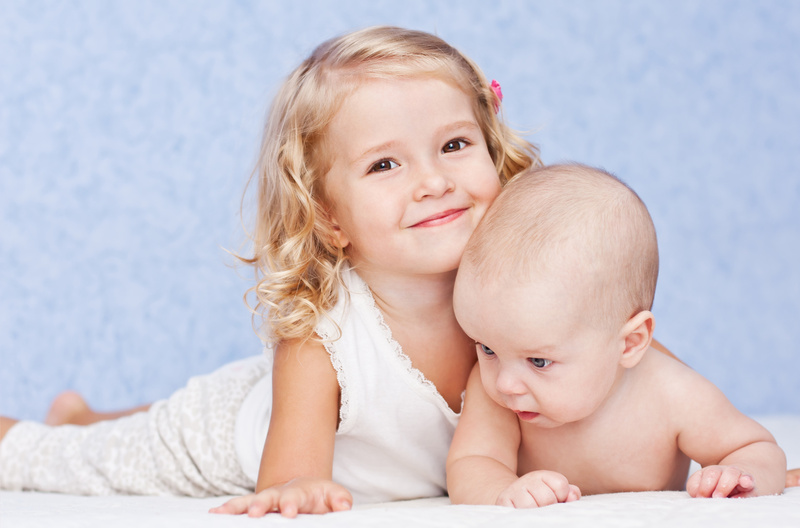 To minimize stress and anxiety stemming from the new addition, keep to your older child’s routine as much as possible. For example, seeing their cereal bowl in the same place at the same time of the morning will bring siblings comfort and will help ease the stress of seeing you holding (or nursing) the new baby while preparing breakfast. 4) Big Kid v. Big Baby: Older siblings need time and space to transition into their new role of big brother or big sister. Some days and moments will be very exciting and easy to accept and others will be very upsetting and difficult. Do not expect your child to always behave like a “big kid”. Give them space to yo-yo a bit and experiment with being a baby again. The new baby will remind them of all the wonderful aspects of being a baby. Thankfully, being a baby is a bit boring and older children will eventually choose to let go of babyhood and embrace being a “big kid”. Make sure your big kid is able to choose the role on his own instead of being forced to assume a position they are not ready to accept. 5) Little Helper: While it is important to point out all the reasons why the new baby will improve your big kid’s life, it is even more crucial to use Baby as an opportunity to help teach your child empathy. Empathy is a key skill that can predict success and happiness later in a child’s life, according to research. Empathy also makes home life easier in the short term. To build empathy, offer plenty of opportunities for your child to “help” the baby. In cases where it would be unsafe to “help”, substitute a doll for the baby and encourage your child to work right alone side you as you care for your babies together. (I recommend the Stella and Sam Dolls by Manhattan Toys for very young children. For older children, find a life like doll that you can bath, change a diaper, offer a pacifier, clothe, etc…). Stress how happy the baby feels when she is cared for and how glad you are to have a special helper. Describe in detail what your child is doing to help and let them draw their own conclusions. Young children will feel more confident and proud of who they are and draw intrinsic worth from their industry when they are active participants at home. This article was written to be a guest post on my friend, Laura Sears’, blog to help welcome the birth of her second beautiful baby. Visit LB Good Spoon for discussions on cooking, home, motherhood and more!